A few days ago the Christian Science Monitor had an interesting article about conservation efforts for bufeos, (also known boto, pink dolphins, or fresh water dolphins). Scientist Fernando Trujillo from the Colombian based Omacha Foundation is behind a five nation project which also includes Bolivia, Peru, Ecuador, and Venezuela. Their research hopes to gather information on population numbers and the current state of the species in order to help project it, and to use the bufeo as the poster child for a larger preservation campaign of the Amazon and Orinoco rivers. Hopefully these efforts won’t be coming too little too late, as was the case just last week with the less fortunate fresh water dolphin in the Yangtze River whose extinction seems to have been confirmed. The Indus, Ganges and Mekon rivers also have fresh water dolphins, the populations of none of which are in good shape. 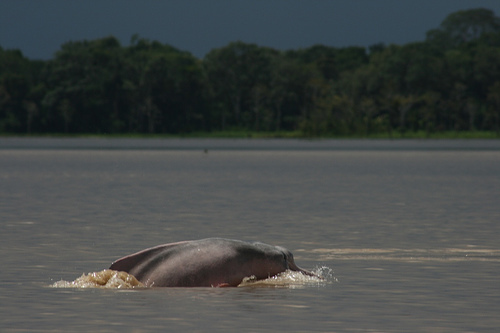 I’ve been lucky enough to have seen pink dolphin while drifting down the Orinoco river many years ago, but the memories are as fresh as if it had been just yesterday; they really are an impressive sight, and hopefully this charisma will help preserve them and the larger river ecosystem in which they live. The International Society for the Preservation of the Tropical Rainforest has some more information on pink river dolphins here, so does Project Boto, here. A good book on the subject is the Journey of the Pink River Dolphin by Sy Montgomery. Boto image by Pasajero on Flickr.